« What is One Seg? On January 23, the National Institute of Advanced Industrial Science and Technology (AIST) in Tsukuba, Ibaraki unveiled its HRP-2 humanoid robot equipped with a new system that enables autonomous self-directed operation. 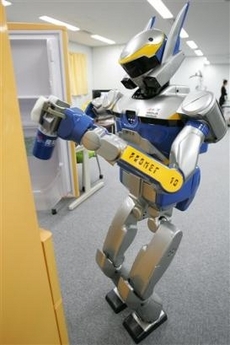 The robot demonstrated the ability to respond to spoken human commands by retrieving a can of juice from a refrigerator and bringing it to the person who requested it. The robot�s head is equipped with improved cameras, which serve as eyes, and it incorporates a system that enables it to perceive its environment, remove any obstacles it encounters along the way, and self-correct its direction if it strays off course. At the demonstration, a person seated at a table instructed a robot to bring him some juice. The robot communicated the command to a second robot, which then walked to the refrigerator, moving chairs out of the way as it proceeded. It opened the door of the refrigerator, retrieved a can of juice, and brought it back to the table. A third robot was responsible for mapping the room. Data was exchanged between the three robots via wireless LAN. The institute would like to integrate these functions into a single robot to create a machine that can provide assistance in real-life situations. why does it look like a decepticon? does it had any other form of propultion?